A client was looking to trace the ancestry of her Irish great-grandmother, Eliza Kennedy. Eliza was the wife of Thomas Morgan and they had several children, among them the client's grandfather, Frank. Not much was known about Eliza; an aunt claimed that Eliza was from Cork and told stories about Eliza chatting in Irish with a friend from "the old country" whose name sounded like "Mr. Rock." The family had passed down a photograph of Eliza taken at the time of her marriage to Thomas in 1867. Irish research is challenging as a result of the loss of records due to civil war (particularly the 1922 Four Courts Fire). Simply knowing that a person was from Ireland doesn't narrow the focus to a specific townland, parish, or even county which is necessary for locating the correct records. In the case of Eliza, the suggestion that she was from County Cork could have meant that she was born there, but about 2.5 million Irish men and women left Ireland from Queenstown, modern-day Cobh, in County Cork, and their point of departure is often confused with their place of birth in family stories. In spite of the difficulties of Irish research, it is possible to locate your Irish ancestors. The following five steps we used to locate Eliza Kennedy can help you find the antecedents of your Irish relations. The work can be slow, but the satisfaction of finally knowing where in Ireland your family lived and worked makes it all worthwhile. All research overseas begins with solid research in the U.S. Begin by finding all pertinent American records related to your Irish ancestor: census enumerations, marriage and death records, the birth, marriage, and death records of their children, the death record of their spouse, obituaries, funeral notices and burial records, naturalization records and passenger lists, and family stories. For Eliza, the 1880, 1900, and 1910 U.S. Censuses and her death certificate all provided clues. The 1880 U.S. Census reported that Eliza was 31 years old, or born in about 1849. The 1900 U.S. Census gave a March 1855 date of birth and an 1870 immigration date. The same years of birth and immigration were provided by the 1910 U.S. Census. Eliza's 4 December 1911 death certificate gave a March 1851 date of birth for Eliza. Unfortunately, her son, Frank mistakenly reported the names of his parents, not hers, on her death certificate. This is not an uncommon occurrence and is understandable when we consider that the informant was often a person who just lost a loved one. In each instance Eliza's place of birth was listed simply as "Ireland." Although Eliza's records did not offer a more specific location for her birth, some records, such as marriage and death certificates, can offer a specific county. For more recent immigrants, you might find "Irish Free State" listed on the 1930 U.S. Census. This indicates that your ancestor was born in one of the 26 counties which make up today's Republic of Ireland, and not the six counties of Northern Ireland. The information regarding Eliza's dates of birth and immigration in the 1900 and 1910 censuses cannot be accurate. They report Eliza arrived in the United States in 1870, but the 1880 U.S. Census listed the Pennsylvania birth of her oldest son, John, occurred in about 1868. Therefore, Eliza must have arrived in the United States no later than 1868. In addition, if Eliza had been born in 1855 she would have been 13 years old when John was born. This is unlikely, given the fact that the average age for a working-class urban woman to marry in the 1860s was 21 years. The photograph of Eliza shows a woman in her 20s, not a girl barely in her teens. 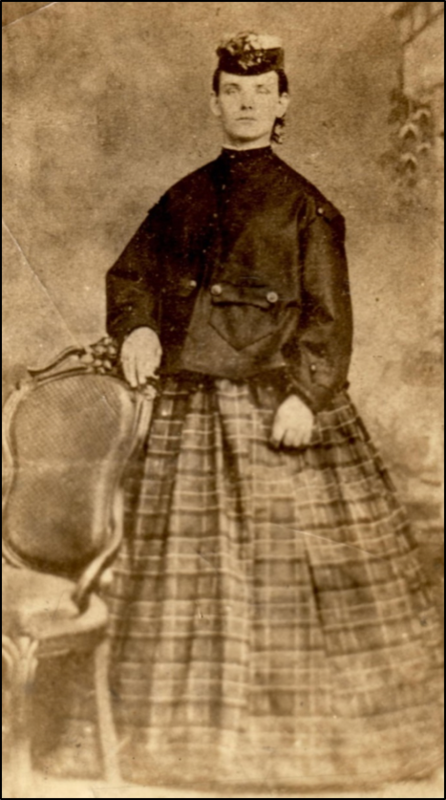 The clothing worn by Eliza, particularly her bonnet, places the date of the photograph between 1863 and 1867, suggesting Eliza's birth occurred in the 1840s, rather than the mid-1850s. Eliza Kennedy Morgan, circa 1867. Photo used with the client's permission. Assuming Eliza and Thomas married the year before the 1868 birth of John Thomas and hypothesizing that Eliza was one of those young women who married around the age of 21, it is more likely that she was born in 1846, plus or minus a year, rather than in the years between 1849 and 1855. It was not uncommon for several children in a family to immigrate together, settling in the same part of the city once they arrived. Having family nearby provided support and protection in a strange place. If family members are located, pursue the same course of research outlined above in an effort to gather additional clues regarding the family's place of residence in Ireland as well as the names of the parents. It is even possible that the parents can be found living in the same or a nearby neighborhood. We searched for evidence of Kennedy families living nearby to Eliza, especially in the 1880 census report, but the surname was too common to determine if any of the individuals were related to Eliza. We did not find any Kennedys listed in the pages immediately prior to or after the census page for Eliza and Thomas. the third son was named after his father. It is important to remember that this was simply a tradition. Young couples may have chosen to name their children in the traditional manner, they may have named their children to honor friends or heroes of their new country, or they may have simply chosen names that they liked. Use the traditional naming pattern as another clue, but don't insist on forcing the pattern to fit the reality of your family. If the traditional naming pattern was used by Eliza and Thomas, that would mean that the first-born son was named for Thomas' father, the second-born son was named for Eliza's father, and the third son was named for Thomas. However, their sons were named John Thomas, Frank Kendrick, Martin, and Shadrack John. None of the surviving sons was named Thomas, although their first-born son bore his father's name as the child's middle name. Therefore, we could not rely on the traditional patterns of naming for identifying Eliza's parents. The for-fee website Irish Ancestors is a great place to learn more about the location of surnames in Ireland. 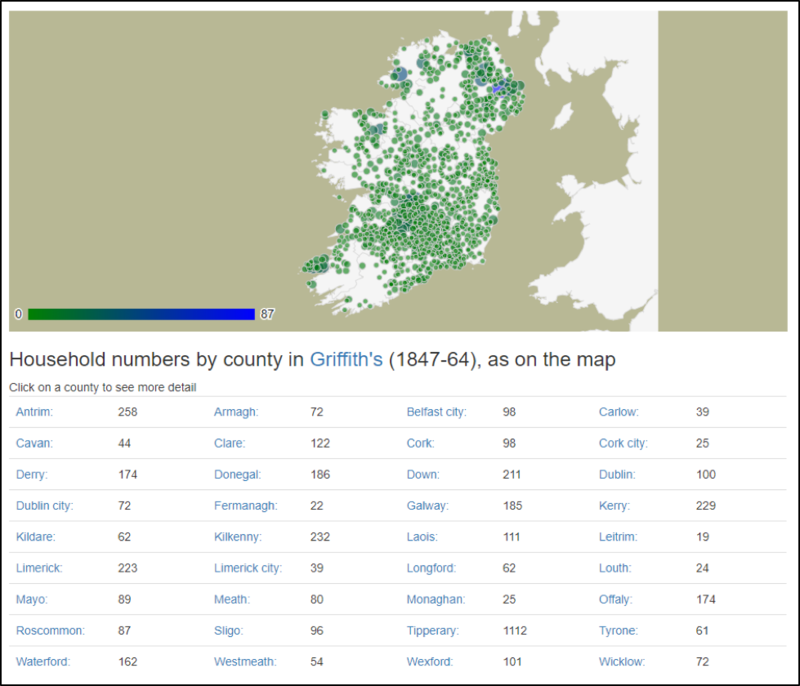 The creator of this website, John Grenham, has compiled all of the surnames from Griffith's Valuation and mapped them by parish and county. This allows users to enter a surname and discover the location or locations where this family resided in the mid-1800s. As the image below indicates, the Kennedy surname is very common throughout Ireland, with the highest concentration of families living in County Tipperary. Location of families with the Kennedy surname. Courtesy https://johngrenham.com. The family friend who visited Eliza, and whose name sounded like "Rock" was most likely Mr. Roche. Lists of Irish surnames, both as they were originally spelled and after they had been Anglicized, can be found in a variety of places online. To hear how a surname is pronounced in various parts of Ireland, try Trinity College's voice synthesizer. The Roche surname was found in southern Ireland, but the highest concentration of those families was in County Cork. If you are trying to track down an obscure townland or parish, remember that your Irish ancestor spoke with an accent. The American (or German, or Italian, etc.) enumerator, clerk, or government official may have had difficulty understanding the exotic-sounding place names, and unless your ancestor could spell the name of his or her home, the person recording the place name had to rely on phonetics. Irish Townlands is a useful, and free, site for locating place names in Ireland; and Irish Ancestors offers assistance, too. This last part is, admittedly, the slow and difficult part. Using the information you have gathered, both the solid facts and the clues, the final step is to compile a list of possible matches for your ancestor and then systematically eliminate those who cannot be the person you are seeking. Of course, as is true in many places, Ireland suffered its share of record destruction throughout the centuries. 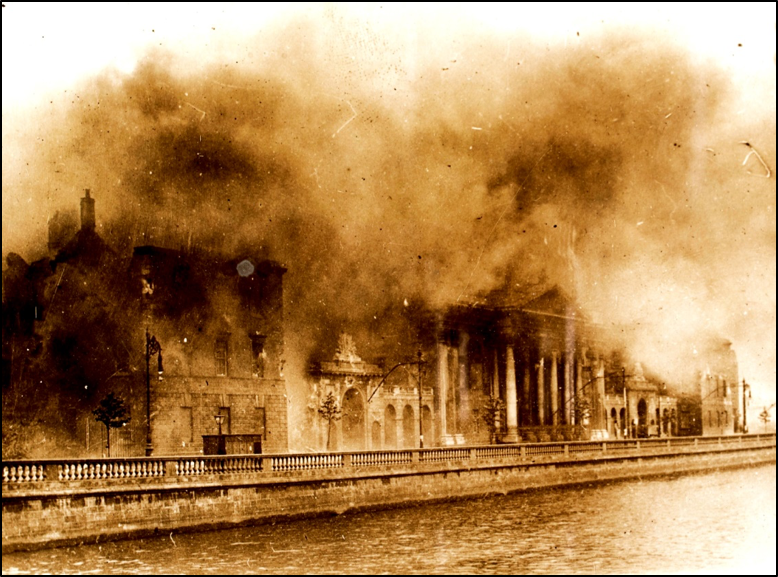 The most famous and far-reaching loss occurred as a result of the 1922 Four Courts Fire. With the exception of a few fragments, all of the 1821 through 1851 Irish Census reports were destroyed. For those with Protestant ancestors, the fire makes researching their families particularly difficult because over half of the Church of Ireland registers for the years 1869-1922 were burned in the fire. The majority of the wills and probate records as well as all pre-1900 legal court records and local government records were victims of the fire, too. "Four Courts Conflagration" [30 June 1922] by National Library of Ireland via Wikimedia. Then we are faced with the intentional destruction of the 1861 and 1871 census records since it was considered that once the totals were taken from the returns those documents were no longer of importance. And the 1881 and 1891 census reports were recycled during World War One. Finally, it is important to remember that not all parish records which do exist, whether Catholic and Protestant, are available online. Sometimes the local priest, minister, or church secretary will agree to search for a specific name if you can provide the date of the baptism or marriage, but if a general search is required, an onsite researcher is necessary. For Eliza Kennedy, we began by searching for birth or baptismal records for Eliza Kennedy born between 1845 and 1855 in all of Ireland. The result was over 150 possible matches. However, when we narrowed the focus to births between 1845 and 1847, the range of dates for her birth we had calculated based on the year of birth of Eliza and Thomas' first son and the approximate date of the photograph, we ended up with 46 possible matches. The family was Catholic, which allowed us to removed nine Church of Ireland, Presbyterian, and Methodist baptismal records. In the 1900 U.S. Census Eliza had reported that her birth occurred in March of 1855. We know that the year is incorrect, but it is unlikely that she would accidentally or intentionally alter the month of her birth. That meant that we were looking for a baptism which occurred in March or April. Of the remaining 37 records, only eight were for baptisms which occurred in March or April. By tracing the lives of those remaining eight young women, eliminating those who died in Ireland and those who we identified as living in Ireland after 1878, we were left with only one candidate: Elizabeth Keneddy [sic], daughter of Roger Keneddy [sic] and Catherine Brown who was baptized on 3 April 1845 in the parish of Killeagh in County Cork. Baptismal record of Eliza Kennedy in April of 1845. Image courtesy https://registers.nli.ie. We located Eliza's baptismal record as well as her parents' marriage record in the Catholic Parish Registers of the National Library Ireland. The baptismal records for Eliza's brothers and sisters (Mary, Martin, Margaret, Maurice, Martin, Johanna, and Roger) were also located. Based on the traditional naming pattern as well as the repetition of the given name Martin (names were often reused after a child died, particularly if the child was named for an important family member) it appears that Roger was the son of Martin and Margaret Kennedy while his wife, Catherine, was the daughter of Maurice and Mary Brown. Although the research process for tracing our Irish ancestors to a specific location in Ireland can be challenging, the reward is great. By following our five steps for researching your Irish ancestors you can make that truncated branch on your lopsided family tree grow. *This post was provided by Legacy Tree Genealogists. Case study shared with client permission.